Wilma Rudolph was born on June 23, 1940 in Bethlehem, Tennessee, one of eight children to parents Ed and Blanche Rudolph. Wilma weighed only four-and-a-half pounds at birth and was born with polio and left for a time with only the use of her right leg because of it. She suffered from double pneumonia twice and scarlet fever once before she was four years of age. For two years, her mother brought her weekly to Meharry Medical College in Nashville for treatment. Her family also massaged her leg at least four times daily. From age five to nine, she wore a metal brace to correct her polio condition. During that time she noticed the trips were always made on segregated buses that required African Americans sit in the back. Rudolph entered Cobb Elementary School in Clarksville in 1947 and it was here that she discovered her passion for sports. In eighth grade, she joined the track team even though basketball was her first love, and ran in five different events in high school. By the age of 16, she was a bronze medalist in the 1956 Olympics. In September of 1958, she entered Tennessee State University majoring in elementary education and psychology. Wilma Rudolph entered the 1960 Olympics and became the first American woman to win three gold medals: in the 100 meter dash, 200 meter dash and the 4 x 100 meter relay. She also set world records for all three events. On May 27, 1963, she graduated from Tennessee State University and was offered a job as an elementary teacher and girl’s track coach at her old school, Clark Elementary School. 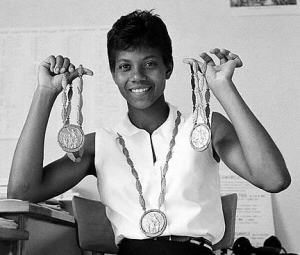 Wilma Rudolph was named United Press Athlete of the Year in 1960, the AP Woman Athlete of the Year in 1960 and 1961, and inducted into the Women’s Sports Hall of Fame in 1994. She died in Clarksville in 1994 at the age of 54. Jessie Carney Smith, Epic Lives: One Hundred Black Women Who Made a Difference (Detroit: Visible Ink Press, 1993); http://www.greatwomen.org/women.php?action=viewone&id=131.